The poor thing started as a perfectly respectable library transaction receipt, left behind by a previous reader tucked into the jacket cover. It began its story fulfilling its purpose and marking the last page I had read; it was soon ripped to shreds, each piece marking pages I needed to come back to. To revisit or just drink again at the tight beauty of Baume’s language. It has been a very long time since I went in to the library and almost randomly pulled from the shelf a new novel by a writer I’ve never heard of. But if I want to be a new writer whose unknown books people take a gamble and read, I need to return to being a reader of such books. And I haven’t been in a very long time. This book reminded me of an epigram I’ve been turning in my head for a decade or more: A good teller makes you think about their story – a great teller makes you think about your own story. Baume caused me to think about very specific parts of my story. Her novel takes place largely at the bungalow the narrator’s grandmother left behind. I wrote a short story many years ago that, I can now see, was an etude on the outsize attachment I’ve felt to the beach house my folks bought for a song in 1973, when it was a tumbledown affair with a leaky roof and an endless supply of curling lead paint. I wrote that story after seeing a piece in the morning Boston Globe about a string of waterfront cottages on Cape Cod that were to become unoccupied as part of the National Seashore. My vague memory is that there were families being pushed out for whom those cottages were part of their story. Part of their place in the world. I was encouraged by the subtlety of Baume’s plot and tension; my first novel includes no car chases and no one hijacking Air Force One or arriving in a space ship to do nefarious things. Mine is, in Faulkner’s memorable phrase, about the human heart in conflict with itself. And, hopefully, about salvation. Page after page of gorgeous language, carefully woven sentences that become gracious paragraphs and pages. The book was due back to the library today. It merited more than a silent goodbye at the return desk. 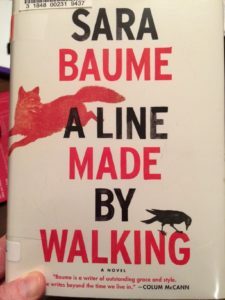 I enlisted the brilliant minds of Google to learn more about Sara Baume. No Twitter handle. No Facebook page. She appears to have made the admirable decision to leave all of that to the side as she uses the words she gets from day to day to make beautiful books. I think I’ll be buying a copy of A Line Made By Walking or her debut novel, Spill Simmer Falter Wither, between now and Christmas. If I want, someday, people to spend actual money to buy my novel although I am unknown, then I should be someone who supports others still near their start. I think she would make a gracious gift. The question now is to whom I should give it. David you make me wanna run over to the library right now. Will add this one to my list. Yours too when available. Keep us posted!